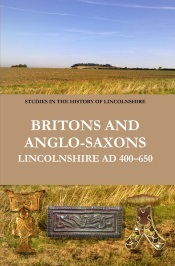 The following post is intended to highlight some of the more interesting Roman, Anglo-Saxon and Viking artefacts that have been found in Lincolnshire in recent years. Two interesting Viking pendants have been recovered from Lincolnshire recently. The first of these is a gold Viking pendant in the form of 'Thor's hammer', which dates from around AD 850–950 and was found near to Spilsby in 2013. 'Thor's hammers' are believed to be amuletic pendants which resembled Mjölnir, the hammer of the Norse god Thor, and they have often been considered to reflect a pagan reaction to the spread of Christianity. In addition to the general symbolism of the item, this pendant is interesting in two regards. First, it is made of gold, whereas most known 'Thor's hammers' are made of other metals, notably silver and copper-alloy; in fact, only one other gold example is known from England (from South Lopham, Norfolk). Second, it is decorated with punched motifs resembling quatrefoils or miniature axes, whereas most English examples are plain or only minimally decorated. The second pendant was found in 2014 at Wintringham, north Lincolnshire. It is a cast silver pendant with a gilded face that depicts the Norse god Odin and his attendant ravens, Huginn and Muninn ('Thought' and 'Memory'). Odin and his ravens are depicted skeletally, with Odin shown with one sighted and one blind eye, clasping the two birds to his chest whilst they appear to whisper into each of his ears. It has been suggested that this tenth-century pendant 'proudly proclaims a militant paganism' in an era that saw the Christianisation of the Scandinavian inhabitants of the 'Danelaw'. 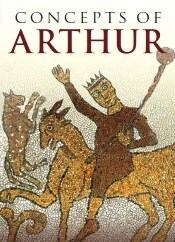 Further, the possibility has been raised that the tripartite grouping of Odin, Huginn and Muninn might be 'a deliberately offensive pastiche of the Christian Trinity or of Christ crucified flanked by thieves', an intent that could also lie behind the resemblance of 'Thor's Hammer' pendants to Christian crucifixes, according to Kevin Leahy (cited in the Portable Antiquities Scheme record). Four sceptres in the form of the helmeted Roman god Mars have been found in Lincolnshire, three of which are illustrated below (the fourth came from the major Roman settlement at Kirmington, north Lincolnshire, and was published in 1989). Mars seems to have been a popular deity in this region and these four sceptre heads have been associated with two similar Mars sceptre heads recovered from the tomb of a Roman priest at Brough on Humber, East Yorkshire. 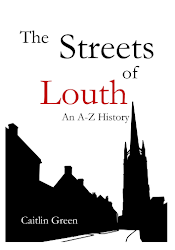 Furthermore, it has been noted that the Nettleham find was made on land to the east of a probable Romano-British temple or sanctuary. A limestone plaque decorated with Romano-British motifs and bearing the inscription DEO MARTI RIGO/NEMETI ET NVMINI/BVS AVGVSTORVM/ Q NERAT PROXSI/MVS ARCVM DE SVO/ DONAVIT was found here in 1961, which has been translated as meaning 'To the god Mars, King of the Grove, and the divine spirits of the emperors, Quintus Neratius Proximus dedicated this arch at his own expense'. 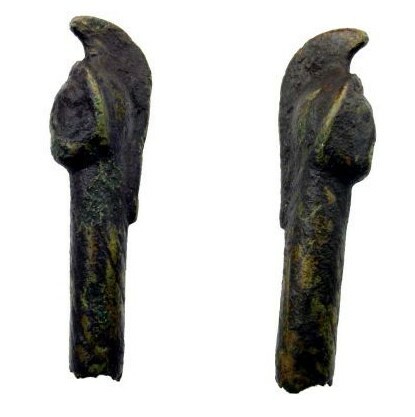 In light of the above, Adam Daubney suggests that the Nettleham sceptre head may have been once part of the priestly regalia associated with the temple here, and a similar suggestion might be appropriate for the other sceptres found in this region too. 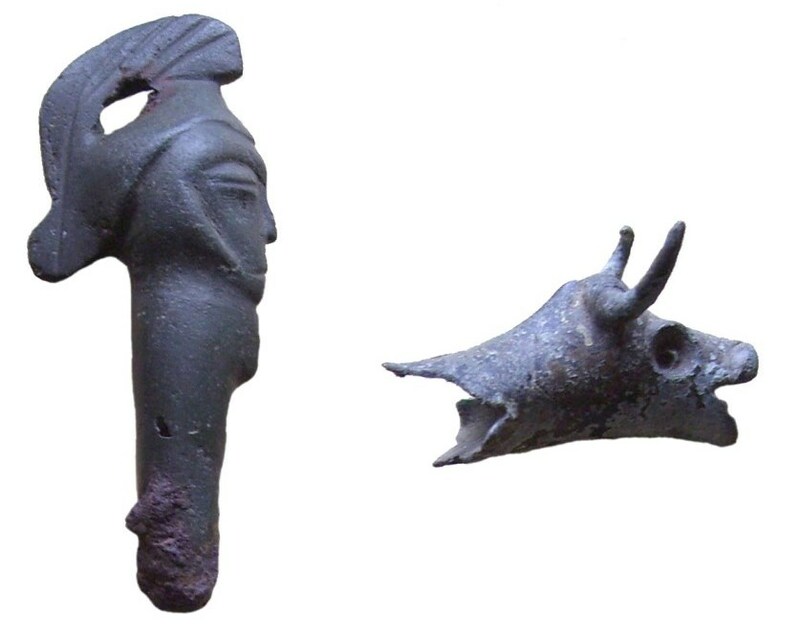 A sceptre head in the form of a helmeted Mars and an ox-head spout, found on the important Romano-British site near Lissingleys/Wickenby, discussed in Britons & Anglo-Saxons, pp. 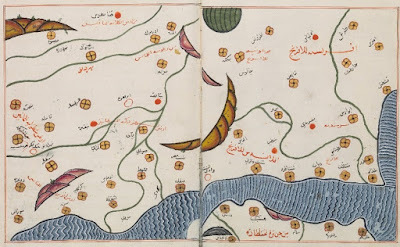 140–5 (image: Britons & Anglo-Saxons, fig. 27; now also at PAS NLM-5FBEB7 & NLM-5DF5D6). Three rather intriguing drilled lead tablets were recovered from Fulstow in 2007 by a metal-detectorist. One of these was blank, but the other two have negative impressions of a coin of the Roman Emperor Valens (364–78) at their centre. The exact purpose of these items is open to debate, but one credible interpretation is that they were used in the forging of late fourth-century silver coins; alternatively, it has been suggested that they possibly could have been intended as pictorial curse tablets used against the Emperor Valens. The site itself is located on the edge of the Late Roman coastal zone and other finds made from it include some bronze casting waste, a lead ingot, and 38 Roman coins. Side A: + þecblœtsigubilwitfæddæ. Side B: ondwerccagehwelchefænondecla. Hines observes that together the texts are remarkably close to a passage of three lines of verse in the Old English poem Azarias (lines 73–5) from the Exeter Book, translated as: Let the glories of the created world and everything made, the heavens and the angels, and the pure water, [and all the power of creation upon Earth], bless Thee, kind Father. These lines, in turn, represent a vernacular paraphrase of part of the 'Book of Daniel' about the three youths in the fiery furnace. The inscription itself is dated to c. 725–825 and the religious character of the inscriptions has led to the suggestion that the item may have had an ecclesiastical purpose, perhaps as tweezers or candle-snuffers used in church rituals. The second item is a lead spindle whorl found at Saltfleetby St Clement in 2010. This piece is inscribed with a Norse runic inscription that probably dates from the earlier eleventh century. The text on the wall of whorl reads .oþen.ok.einmtalr.ok.þalfa.þeir., whilst that on the flat face reads ielba.þeruolflt.ok.kiriuesf.. John Hines suggests that the first part can be translated as 'Óðinn and Heimdallr and Þjálfa, they...', whilst the second part is more obscure but seems to carry on '...help thee Úlfljótr and....' (the meaning of the last word, kiriuesf, is uncertain). Óðinn and Heimdallr are, of course, major gods of the pre-Christian Viking pantheon, and Þjálfa could be a previously unrecorded feminine counterpart to Þjálfi, a servant-boy of the god Thor known from Old Norse sources. Úlfljótr, in contrast, is a man's name, with the result that the inscription as a whole would appear to represent a simple personal invocation of traditional gods and powers for the support of Úlfljótr, whoever he may have been: 'Óðinn and Heimdallr and Þjálfa, they help thee, Úlfljótr...'. 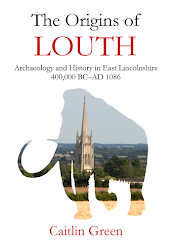 This is naturally of considerable interest, especially given the likely date of the object, and the inscription constitutes important evidence for the persistence of non-Christian cult on the east coast of Lincolnshire into the eleventh century. Original content on this post and page is copyright © Caitlin R. Green, 2014. This post also contains text sourced and adapted from the Portable Antiquities Scheme website (licensed under a Creative Commons CC-BY 3.0 license) and images from this site too (licensed under a Creative Commons CC BY-SA 2.0 licence).